Today Rui Costa of the Movistar team managed to get away in the last 10 km from a break group, climb the Col de Manse and stay away from a single competitor to come alone to the finish line. The Tour de Suisse winner was break of a 26-man break early on in the stage from Vaison-La-Romaine to Gap, traveling over mountainous areas, and ending in a category 3 climb that dropped down to the town of Gap. It was his second Tour de France stage win. Andreas Kloden of Team RadioShack Leopard, Arnold Jeanneson of FDJ, and Jerome Coppel of the Cofidis team who were part of the earlier break put in a good effort to chase Costa down, but they couldn’t reach him before the finish. They came in the order of Ribon, Jeannesson, Coppel and Kloden at the finish. Tom Dumoulin of team Argo Shimano who was part of the big break, also stayed ahead of the peloton all the way to Gap, and received the honor of the White Jersey for best young rider. Thomas Voeckler and Cyril Gautier who were part of the original 26-man break received big applause from the French crowd, coming in 19th and 12th to the line. They also were still ahead of the peloton. Behind in the peloton there was some excitement when Alberto Contador and Roman Kreuziger attacked on the ascent and the descent of the Col de Manse, which was within the last few kilometers of the stage, prompting a chase by Chris Froome. Then Contador crashed out on the descent from the Col de Manse, causing Froome to go off the road. “I was happy to get to the end without doing too much damage,” he said, thanking teammate Richie Porte for covering about 10 attacks from Contador, Kreuziger, and other riders. attack. After all the fuss, the three top riders are still in the same position, with Bauke Mollema 4 minutes 14 seconds back, and Contador 4 minutes and 25 seconds behind Froome. It seems that GC contender Andy Schleck is having a bad Tour overall. 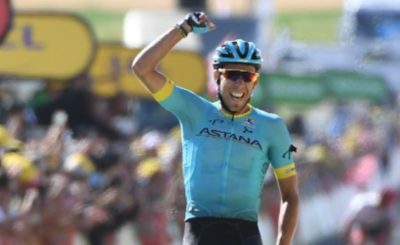 First he was seriously dropped on Mont Ventoux by the aggressive actions of Froome and Nairo Quintana: then today he became part of a group that was behind the peloton again. Mikel Nieve and Pierre Rolland were also part of that group, hurting at least for now both of their chances for a special win at the Tour. Today’s stage was bound to be one of the worst for the riders. Long flat areas followed by continuous climbs in hot weather nearing 95 degrees Fahrenheit, would put the devil in their legs. 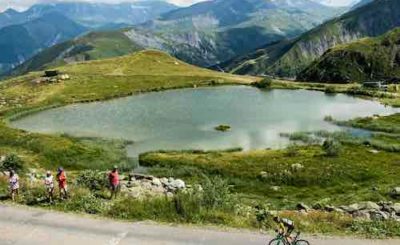 The 168 km stage in the French Alps included a 3-category climb at Cote de la Montagne de Bluye, a category 2 cliimb at the Col de Macuegne, and a final category 2 climb at Col de Manse before the riders would descend into Gap. An intermediate sprint three quarters of the way to Gap, in Veynes, would give sprinters Peter Sagan who held the Green Jersey, and Sylvain Chavanel, second runner up, another opportunity to gain more points. 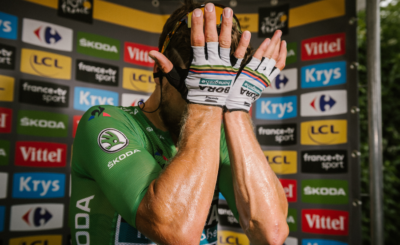 And in the end, it was Sagan who still keeps the coveted distinction. The day started with the tension that many of the team felt after Mont Ventoux where Chris Froome and Nairo Quintana dominated, and battled it out to the top in the first and second place. Today’s stage would test the leaders’ ability to hold onto their placements, with Froome leading by a full 4 minutes and 14 seconds to Bauke Mollema, who actually came in eighth in the stage, then Alberto Contador who was left climbing on the mountain behind Froome and Quintana. An early break was established today, and as the riders wound their way through cavernous gorges carved in stone, the peloton which contained Froome and other GC contenders was 7 minutes and 20 seconds behind. Among the 26 break riders was one of France’s favorites, Europcar’s Thomas Voeckler who yesterday vowed to make more of a difference in the last week of the Tour as the Team searched for a new co-sponsor. With Voeckler was his teammate Cyril Gautier, Adam Hansen (LTB), Phillipe Gilbert and Manuel Quinziato (BMC), Laurent Didier, Tony Gallopin and Andreas Kloden (RTL), Blel Kadri and Cristophe Riblon (ALM), Nicolas Roche (TST), Yuri Trofimov (KAT), Mikel Astarloza (EUS), Arnold Jeannesson (FDJ), Rui Costa (MOV), Jerome Coppel and Daniel Navarro (COF), Manuele Mori (LAM), Peter Velits (OPQ), Ramunas Navardauskas (GRS), Michael Albasini and Cameron Meyer (OGE), Tom Dumoulin (ARG), Thomas De Gendt and Johnny Hoogerland (VCD) and Jean Marc Marino (SOJ). With 60 km to go, the group was still ahead by 8 minutes and 51 seconds. But still ahead of them was the Col de Manse, lined with screaming, and some, drunk fans. At 55 km they were 9 minutes and 8 seconds ahead, as more carved rock canyons beckoned, running along the creamy blue waters of l’Ouveze river. A lot was hanging on this stage: while Mont Ventoux put a huge dent in the GC classification for the likes of Alberto Contador, today’s stage was one of the few left where the teams and riders that hadn’t won a stage so far, could possibly do so. Meanwhile, several riders were fallen by digestive trouble today, among them the sprinter Mark Cavendish of team Omega Pharma Quickstep, and he was joined by Bram Tankin (Bel), Davide Malacarne (EUC) and Maarten Wynants. Is something going around? Remember Cavendish had similar complaints at the beginning of the Tour.